Santa Claus has his own kind of occult life insurance. If he dies, the person who puts on his suit becomes him (against their will), replete with obesity genes, forceful beard that cannot be shaved off and occult powers of transmogrification; Santa Claus’s life essence preserved and transferred, the person who becomes him having no choice but to continue prosecuting his socialist ideology. What kind of devilry is this? 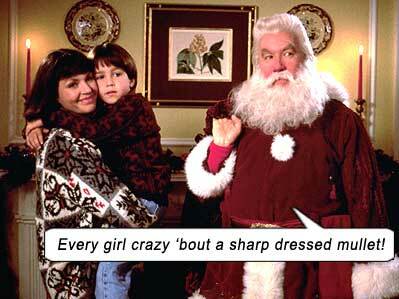 In THE SANTA CLAUSE, Claus travels with a business card in his pocket, alerting people to this mystic fiat. In small print. That’s right: apparently, Claus is as duplicitous as any corporation or politician, because his job is obviously so distressing that he’s sure people would run screaming if given full disclosure. Enter Scott Calvin (Tim Allen), a divorced toy executive with a young son Charlie (Eric Lloyd), living comfortably in Rich White Suburbia USA, whose roof Claus falls off and dies one joyous Christmas Eve. This is how this kiddie movie opens, parents. The death of Santa Claus. Fun, no? Scott Calvin (hah! S.C. – get it?) finds a business card in Claus’s pocket that says, “If something should happen to me, put on my suit. The reindeer will know what to do.” He does not see the small print. Claus disappears upon his death (oh-ho! More occult powers – disintegration) and Calvin and Charlie are spirited off by the reindeer in Claus’s sleigh, to deliver presents for the rest of the night. Then it’s off to Claus’s sweatshop at the North Pole (where the elves are at least two centuries behind the real world, busy making Agrarian Age toys like dollhouses and toy soldiers), where Calvin and Charlie meet head elf Bernard (David Krumholtz) who fills Calvin in on the duplicitous “Santa Clause” that magically renders him Santa Claus. When Charlie yaps to Calvin’s ex-wife (Wendy Crewson – sporting the worst hairstyle of the 80s paid forward into the 90s) about meeting elves at the North Pole, she sarcastically snipes to father Calvin, “Thanks for keeping him grounded!” Typical dreamkiller shrike. The boy is 7 years old – he can’t have an imagination?! She’s married to stuffed-shirt psychiatrist, Neil (Judge Reinhold, who phones in a wide-eyed dork performance like a champion). When Charlie mentions that Judy (an elf) gave Calvin pajamas, why is ex-wife making that face at Calvin? What makes you think you get a say in his love life anymore, whore? After re-marrying and wearing your hair like that?! SANTA CLAUSE is one of those movies that tries to answer all those questions one obviously asks about Santa Claus after the Age of Reasoning: How does he break into houses without chimneys? How does he manage to carry around all those toys in one bag? How do the reindeer fly? And how will Calvin possibly visit all the children in the world in one night? (At the rate he’s going, he should be finished his circumnavigation of the world in about fifty-seven years.) So the movie even addresses time-dilation (albeit in a manner prosaic enough for Santa-philes to grasp). Answer to all these and many more mysteries: MAGIC, of course (the last bastion of idiotic storytelling – no rules, no limits, no sense). When Christmas Eve rolls around again, Calvin has surrendered to the hideous Santa Gene Makeover and accepts wholeheartedly his new identity. Movie plumbs new depths of shark-jumping when sniggering cops nab Santa for kidnapping Charlie, and the North Pole dispatches its version of a SWAT team – E.L.F.S. Like reindeer, these ELFS can also fly – but we see they’re using jetpacks! What, no more magic reindeer angel dust to go ’round? They spring Santa, and I guess the paperwork musta been too much for the police to report four kids assaulting a police officer and destroying a jail cell. And later, when all the cops and neighbors descend on Charlie’s house and Santa actually does a slow flyover, I guess none of the witnesses thought to report it to the authorities, or to even register it in their memories, so that when the next Santa movie rolls around they can all forget again that Santa exists and harbor the same godforsaken insane disbelief. Starring: Tim Allen, Judge Reinhold, Wendy Crewson, Eric Lloyd, David Krumholtz, Larry Brandenburg, Mary Gross, Paige Tamada, Peter Boyle. Why – in every single Santa movie – do grownups deny the existence of Claus with EVIDENCE in the form of gifts staring them in the face every Christmas morning? If you are receiving anonymous presents every year (for free, no less! ), isn’t that proof enough that someone – call them Secret Admirer, Benefactor, God, Santa Claus – exists? And in all Santa movies, if there’s any doubt that he exists, the longest anyone would have to wait to prove or disprove his existence is 365 days (in a leap year) and see whether anonymous presents appear under the tree. It’s not a question of “belief” or “disbelief” – it’s based on EVIDENCE. PROOF. PHYSICAL THINGS. This movie and its ilk are not annoying because of their maudlin storylines, worn-to-death tropes and pat resolutions (although all that syrup only contributes towards turning children into homicidal maniacs); they’re infuriating due to that simple paradox (which is also contributing towards those same maniacs). Either there are anonymous gifts every year. Or there aren’t. If there are, then Santa exists. What kind of a maniac would you be to deny him? If not, he’s as much a figment of your imagination as your god that NEVER shows himself.